Having a beige couch with 4 beige pillows can seem quite...boring. So, in order to liven up my husband's office, I opted for pillow covers. I found this fabric and knew I had to use it. Luckily, I have a great friend who loves to sew! I started by measuring my original pillow and cutting the fabric and fabric lining 1/2 inch more per side (for the seams). Then we turned the fabrics facing each other to pin. I pinned the ribbon ties along the edges also facing in (so, when we finished sewing and turned it right side out, the ribbons would be hanging out). After sewing, we pressed the edges. 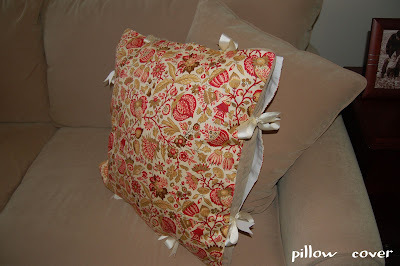 Then I tied the two fabric pieces together with the pillow inside, and voila! 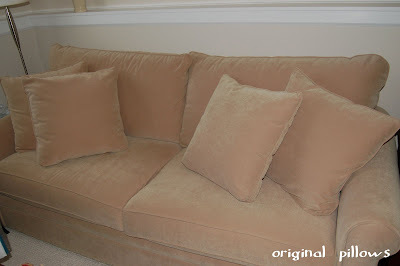 I now have some excitement to my beige couch!! Now we can sit and enjoy! My friend even made a window treatment using the same fabric and fabric lining. She made a large rectangle for the window and then used the same ribbon to tie the edges giving it more shape. Such a quick and easy solution to my world of beige! I'll be linking to these great parties this week, so be sure to check them out! Enjoy your summer weekend!! It looks great. 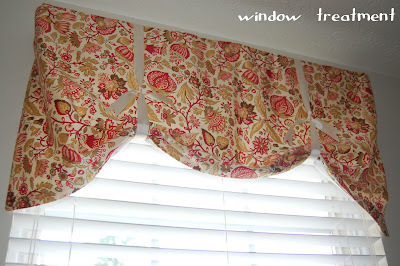 I like the use of the ribbons on the pillow cover and the valance looks very nice. Good choice. I have always loved that fabric you chose. It goes perfectly in the room and such a great solution to easily cover pillows that need a little color! Looks awesome! I love the fabric Amy! I love these. What a great solution for something you don't want to be permanent. Gorgeous fabric. Those are so cute and easy! 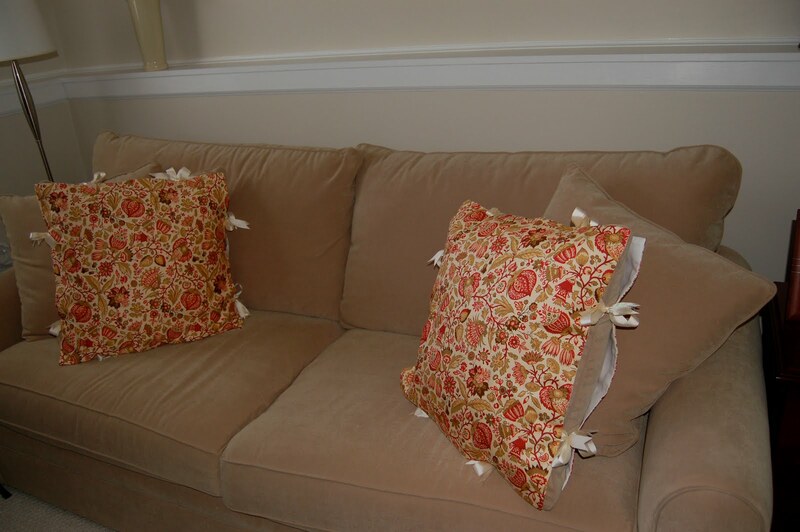 Maybe I will do that with some of our sofa pillows instead of just buying new ones. I love love love the colors and pattern in that fabric. Lovely! I was totally thinking you could do this and switch them out through the seasons! 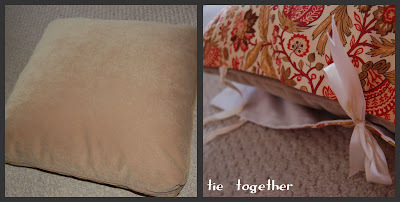 Gorgeous fabric and i love the way you made the covers a tie on - easy to clean and something different! These look so great! I love the addition of the ribbon, it adds a great little something extra. The fabric is beautiful! Definitely a nice splash of color. Lurv that pattern. What a cute twist on a slip cover! I love the matching window treatment too! What a great solution!!! I recently wanted to lighten up the red pillows on my couch but didn't want to purchase new ones. I ended up buying cheap muslin and wrapping them like a package and pinning the fabric to the back with safety pins ... i know ...UGH!!! Your idea will get me moving in a better direction. Thanks!!! The pillows are really cute, but I love, love, love the easy window treatments! I need to do something for my bedroom, and I think this is the perfect (easy) solution. Easy being the key word! I love that fabric! And I love how quick and easy it will be to launder these. I just saw that this whole post was featured on Remodelaholic here, didn't know if you'd seen it. Erin-Thanks so much for letting me know!! I have been wanting to make seasonal pillows for our back porch (Halloween, Fall, Christmas, etc) as we use it almost year round. Problem - I didn't have the space to store 8 pillows for each season. Here is my solution! 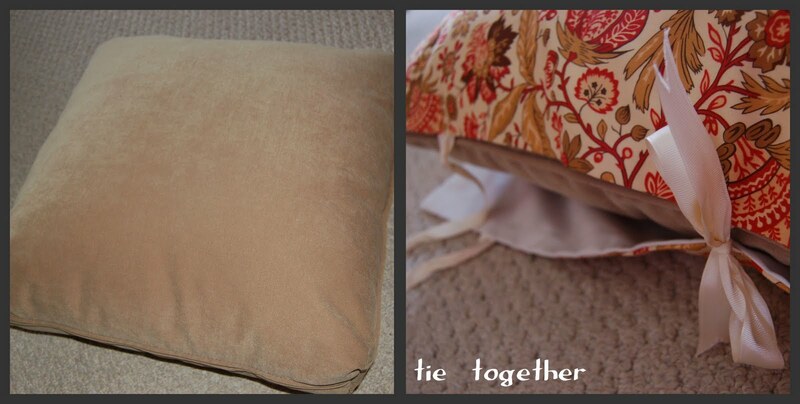 One set of pillows and and a set of pillow covers for each season/holiday. Thanks for solving my problem! The popularity of your link-up has earned a feature as one of this week's top 10 favorites on my weekly newsletter! Great post!